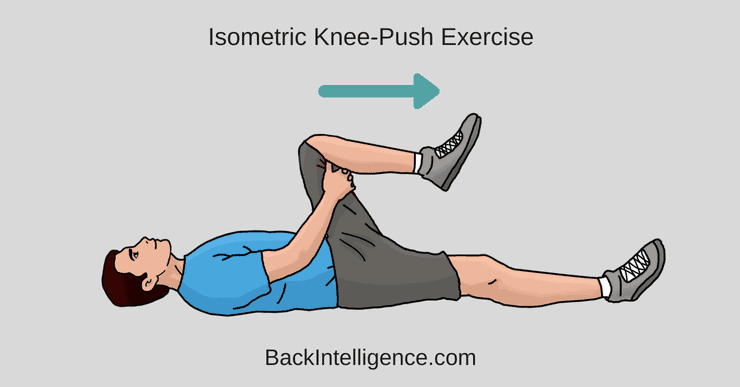 Luckily, with the right sacroiliac joint exercises (below) you can get relief. Let’s take a closer look at what SIJ pain is, what causes it, and what you can do to manage your symptoms. The sacroiliac joint (SIJ) is a major contributor to low back pain, affecting approximately 15% to 25% of low back pain sufferers. 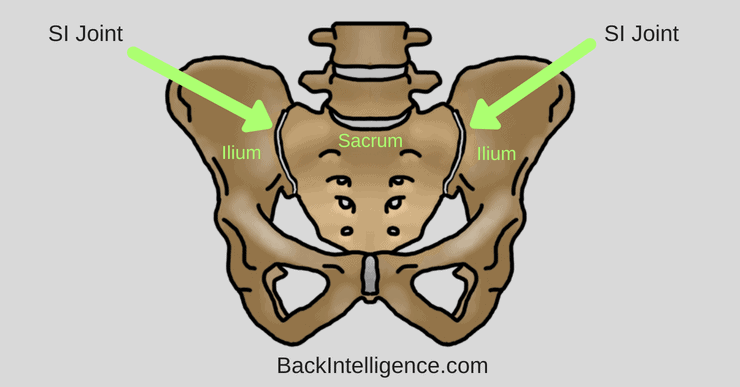 The SI Joint is the joint that connects the sacrum, which is the triangular shaped bone located at the bottom of your spine (just above your tailbone), to the left and right sides of your iliac bones, which are the large bones that form your pelvis. The sacroiliac joints are incredibly important as they support the weight of your torso when you’re upright; help maintain balance as you walk, and act as shock absorbers for your spine. SI joint pain refers to pain that comes from the SI Joint structures. This means that there is too much movement of the SIJ that can cause the pelvis to feel unstable and ultimately lead to pain. When hypermobility is the issue, the pain is usually felt in the lower back and/or hip and in some cases, may radiate into the groin on the affected side. This means that there is too little movement of the SIJ that leads to tense muscles, pain, and decreased range of motion. When hypomobility is the issue, the pain is usually experienced on one side of the lower back and/or buttocks, and may radiate to the back of the thigh. – Gait (how you walk) and postural abnormalities including scoliosis and leg length discrepancies place unequal pressure on one side of the pelvis, resulting in wear and tear of the SIJ. – Leaning on one leg for long periods of time. – Continuous trauma or stress to the SIJ such as repeated heavy lifting, and contact sports can lead to SIJ pain, especially if the muscles of the lower back and pelvis are not conditioned properly. – Increasing age resulting in wear and tear of the SI joints. – Pregnancy and post-partum are common causes of SIJ pain because of an increase in weight, stretching of the abdominal muscles to accommodate an expanding uterus, shifting hormone levels, which cause the SIJ to become hypermobile, as well as the pelvic changes that occur during childbirth. 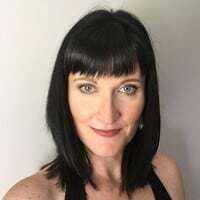 While these changes resolve for most women, if the ligaments remain loose following childbirth, on-going SIJ pain and instability can result. – Previous lower back surgery and hip joint replacement may displace pressure onto the SIJ, especially after spinal fusion surgery, and multilevel surgeries. – Prolonged sitting or standing. In addition, in some cases, SIJ pain may be the result of inflammation, known as sacroilitis Sacroiliac dysfunction from either hyper or hypomobility can cause SIJ inflammation, or inflammation may result from other causes such as injury, infection, arthritis, or similar conditions. Start by applying ice for 15 minutes at a time (For several days) to the affected SIJ to help reduce inflammation, which in turn will help to alleviate pain and discomfort. After you have reduced some of the inflammation proceed to the exercises below. Strengthens the muscles of your buttocks, thereby helping to improve stability of the SIJ. – Begin by lying on your back. 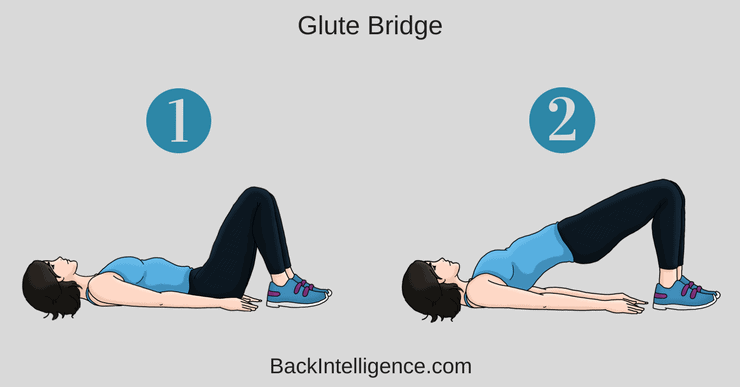 Strengthens your lower back and glutes, thereby helping to improve the stability of the SIJ. – Begin lying on your back on the floor with your knees bent and feet positioned flat on the floor with your arms positioned beside your torso. – Hold this position for 10 seconds and return slowly to the starting position. Improves core and buttocks muscle stability, thereby improving stability of the SIJ. – Begin lying on your back, with your knees bent to 90 degrees, with a ball positioned in between your knees, and feet positioned flat on the floor. – Have a natural arch to your low back and pull your bellybutton in towards your spine. 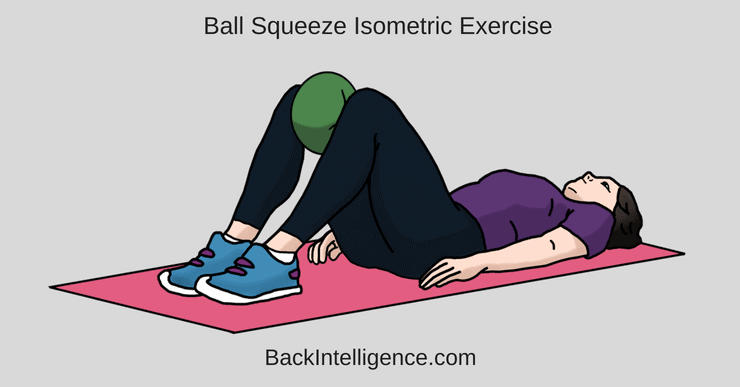 – Squeeze the ball with your knees. – Hold for 10 seconds. 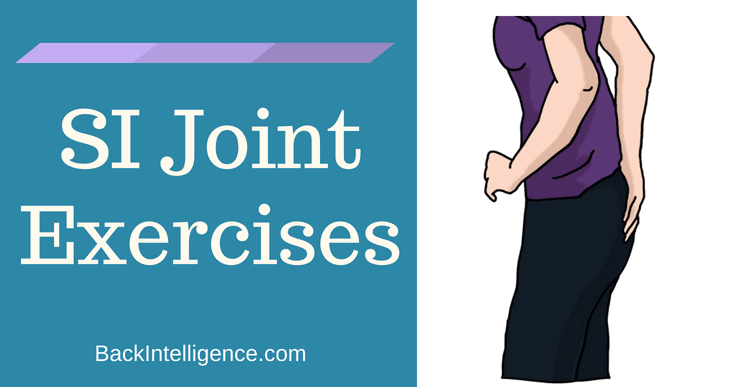 You’re challenging your pelvis and lower back muscles with this exercise to increase stability of the SI Joint. – Begin lying on your back, with your knees bent to 90 degrees, and the band wrapped around your knees. – Slightly pull your knees apart and bring them back together. – Aim for 15 to 20 repetitions. 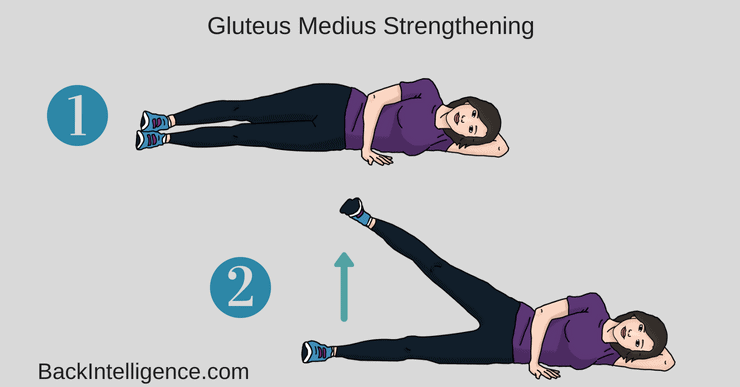 The gluteus medius muscle is one of the main stabilizers of the pelvis, so this exercise will strengthen it. – Lie on on side on the floor with the feet and legs stacked on top of each other. – Lift on leg slowly and hold for 2 seconds in the air. – Bring the leg down slowly. * You don’t need to lift the leg too high to feel it working. Strengthens your lower back and abdominal muscles, thereby helping to improve stability of the SIJ. 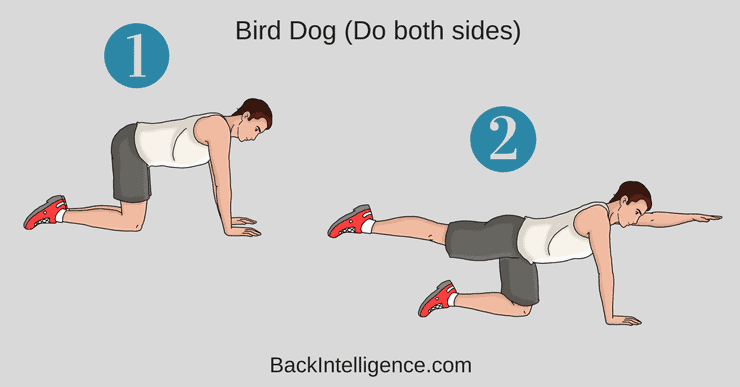 – Alternate sides for 10 repetitions. 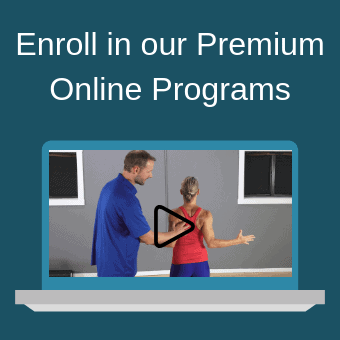 If you’re suffering with SIJ pain that is interfering with your life, home treatment including ice, as well as SIJ stabilization exercises can help set you on the right path towards pain free movements. However, in some cases, your pain may not resolve, and you may need to seek out a healthcare provider, such as a physical therapist or chiropractor, to help get your symptoms under control. Are Sit ups bad for your back?